then manually convert a tube to PSP7 version. In today's tutorial, again kind of a technical one, we will take a look at managing all our Picture Tubes and cover the following 4 areas. 1. How to convert PSP6 or PSP5 tubes to PSP7 tubes using JASC's Tube converter. 2. How to create a new tubes Folder for PSP7, using the Browser in PSP7.01. 3. How to use File Locations in PSP7 to change the default folder for PSP 7 Tubes to new folder so all new tubes will save there instead of to the default PSP7 tubes folder. 4. How to manually convert a tube to PSP7 tube type. 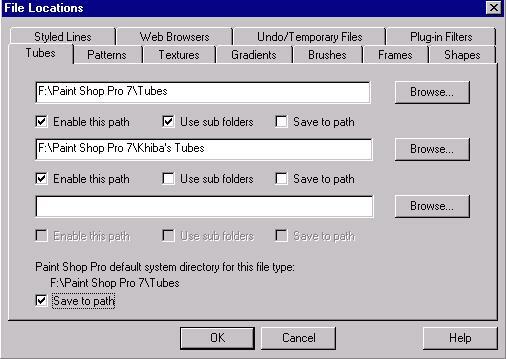 As most of you had Paint Shop Pro Version 6, and probably downloaded a bunch of tubes from the Internet, let's start with Converting tubes from PSP 5 or 6 to PSP 7. We will convert a downloaded tube to PSP7 version and put in PSP7\Tubes folder. Click this link, tubefiles.zip, to download a Zip of all three files you will need for this tutorial. UnZIP them to any folder on your hard drive, except the PSP7/Tubes folder. NOTE: The method on the left causes corruption in the files and they will not be usable. BUBBLES.tub will be in the folder where you downloaded and UnZipped the tutorial. We can convert it from where ever to PSP7 folder without any intermediate moves. AOL users: downloading into your Download folder is just fine. JASC has included a Tube Converter Utility program with PSP7 found on the Windows Start Menu. Go to Start>Programs>JASC Software> Utilities> JASC Tube Converter. When the dialog box opens, note the two type in boxes, and the Browse buttons next to them. The top box needs to point to the folder containing the older ( bubbles.tub ) version tubes. The bottom box needs to point to the tubes folder in the PSP7 folder. In this example we will convert a tube in a download folder in AOL as if you downloaded from our Tubes library or from the Internet using AOL. Everyone else browse to wherever you put the bubbles.tub file! Make sure the bottom box is pointed to the PSP7\Tubes folder. When both boxes are set up properly, press the OK button and watch the converter run. Since there was only one tube, BUBBLES.tub in my download folder, the dialog box reflects only one converted tube. That's all there is to it. (See below) Press Close to close the utility. NOTE: "Convert" copies the tube to the PSP7 folder making it safe to delete or move the original tube in the download folder! Let's see if PSP7 can "see" the tube on its Tools Options palette. Open an new file in PSP7. Any size is fine, for the test. Make sure its 24bit 16 million colors. Select the Picture Tube Tool from the Tool Palette. On the Tool Options palette on the first tab, click the downfacing arrow next to the tube thumbnail and scroll down to find Bubbles. As you mouse over the thumbnail of Bubbles, note that the Path pops up under the cursor. This indicates where the .tub file itself is located. As you can see, its where we put it in the conversion process, under the PSP7\tubes folder. With Version 7 comes the functionality to scan more than one folder for tubes and display their thumbnails on the Tool Options palette. Why would you want another folder? Several reasons. 1. PSP7 gets uninstalled or goes Kaput. 2. 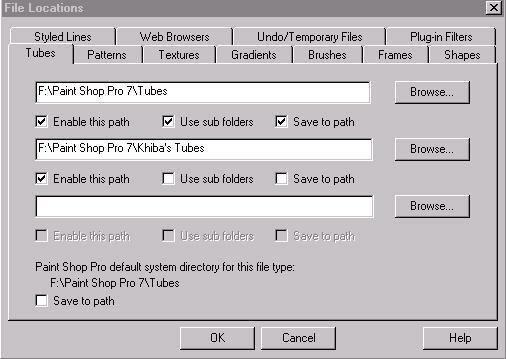 You make lots of tubes and don't want them mixed in with the PSP7 default ones. 3. You would like to keep tubes from old versions in a separate folder. With those reasons in mind let's make a new Tubes Folder and have PSP7 find it. With PSP7 open, go to File>Browse and open the PSP 7 Folder on the left panel, if it is not already selected. Let's make another folder under Paint Shop Pro 7, so select the main folder, PSP7, and go to File on the menu bar and Create New folder. On the New Folder dialog box, enter a name for the new folder. I put in Khiba's Tubes. Press OK. NOTE: Creating a new folder functionality is part of the PSP7.01 patch we keep discussing. It will NOT work in the release version 7.00. Close the Browser window and you are done! With PSP open, BUT NO IMAGE OPEN, Go to File on the Menu Bar and Preferences>File Locations to open the Tubes Tab on the File Locations dialog box. The default should look something like the image below. 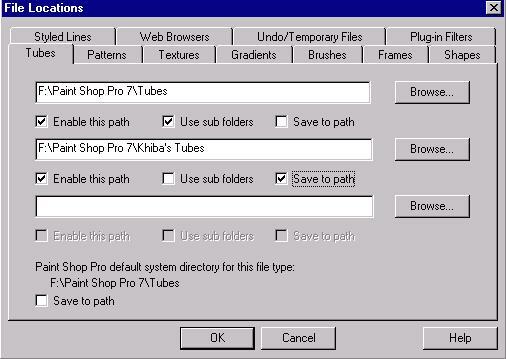 As it stands, PSP7 will only look for tubes in the Tubes folder and will save all new tubes to that folder. 1. On the second type in line, click the browse button, find and select the new folder we just made. In my case it's Khiba's Tubes. The path will show up on the second line and the Enable this path check box will be checked automatically. 2. At the very bottom left of the dialog box, CHECK Save to path box under Paint Shop Pro default system directory for this file type. The box next to Save to Path for the top box, PSP7\Tubes will uncheck itself. 3. Next, CHECK the Save to path box under the Second folder, Khiba's Tubes, or whatever folder you have there. When your dialog box looks something like mine above, click OK to close the box. NOTE: The wording will never change at the bottom of that dialog box for the Paint Shop Pro default system directory to point to the new default we just set. I think this is just a reminder for you, and an easy way to reset the default if you like, by clicking that box. Strange but true! Also note: Changing the default folder will not work with an image open and/or the Picture Tube tool selected!. Since we told PSP to save all new tubes in the Khiba's tubes folder, let's test this out. See if PSP made the switch. 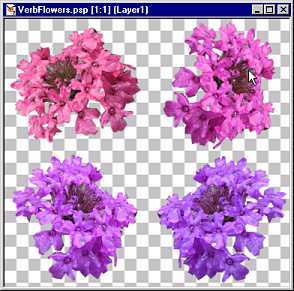 In PSP7 go to File> Open on the menu Bar and find the file called VerbFlowers.psp in the folder where you downloaded and unzipped the tubefiles.zip or the AOL tutorial. It opens with 4 images against a transparent background, one layer. Since its ready to Tube, go to File > Export> Picture Tube to open the export tube dialog box. Set the Cells across to 2 and the Cells down to 2. The Total Cells should automatically change to 4 with a Cell width of 190 and Cell height of 178. Over on the right, Name the tube in the type in box. Verbena Flowers. 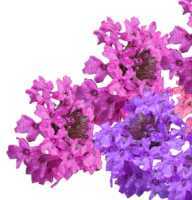 Under that the file name will show as Verbena Flowers.tub. Press OK to save the tube file. Open a new file in PSP, about 400 X 600 is fine. Pick the Picture Tube Tool and make sure the Tool Options palette is visible. On the Tool Options Palette, click the down facing arrow to view all the thumbnails. See if Verbena flowers is there, and run the mouse over it's thumbnail. The pop up should read ...PSP7\Khiba's tubes\Verbena flowers.tub. Spray the tube on the new file to see what it looks like. Not bad, eh, but we need some leaves!. We will work on that in part 4. Part 4: How to manually convert a Tube that doesn't convert with the converter utility. Let's say you convert a whole folder of tubes from PSP 5 or 6 and have one that does not convert as indicated by an error type message on the Converter utility. What can we do to salvage the Tube? Manually convert it, is what. Go to File> Browse on PSP's menu bar and browse to the folder where you downloaded and unzipped the tubefiles.zip or the AOL tutorial. Included in the download is a messed up tube file, Verbena ..t ub, that PSP7 will not recognize as a tube. It probably did NOT find it at all on the conversion process, yet it is there! Notice that the thumbnail shows up on the browser window! Double click this file and lo and behold, it will open nicely in PSP7! Looks fine! NOTE: Usually a tube fails to convert because its name is messed up or the file is missing some component PSP needs to identify it as a real tube file. Open it in PSP to manually re-tube! For safety's sake, though, always Viruscan any file you download just to make sure! Next step is to make sure its ready to retube. Make sure the images are lined up and on one layer with a transparent background. Next do the dirty deed. On the Export Dialog box, set the cells across to 1 and Cells down to 3. Total cells should be 3. Now (since I made the tube, and I know how it should spray by default, trust me on this.) Under Placement Options set the Placement mode to continuous and the Selection Mode to Incremental. Give the tube its name, Verbena Leaves. 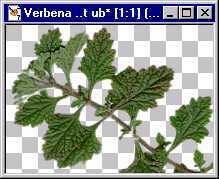 Note that the file name will be Verbena Leaves.tub. Test it out. :) It should have saved in the new Folder, Khiba's tubes or whatever you named yours. Open a new file in PSP7. 600 X 400 works well. 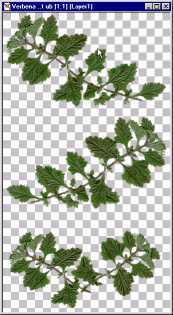 Pick the Picture Tube Tool and on the Tool Options Palette click the downfacing arrow next to the thumbnail and see if the Verbena Leaves is there. Click once in the image right side of the middle to spray an image headed to the right. The next spray will be in the middle headed up. The third spray will be headed to the left. Next pick the Verbena Flowers from the Tool Options palette and scale it to about 50 percent and spray some flowers. If you don't like one just sprayed, UNDO it and spray another. You should end up with an image which looks similar to mine below. Enjoy the tube. Hope you enjoyed the Tutorial. Addendum - Geeky facts - or why PSP does what it does. 1. When there is only one folder for tubes indicated on the File Locations area, say just the PSP\Tubes folder, all the tubes in that folder will show up alphabetized on the Tools Option Palette thumbnails. 2. When you add another folder in File Locations and look at the thumbnails on the Tool Options Palette, the Tubes will show up alphabetically sorted first by the Folder and then by the Tube. For example when we made the Khiba's Tubes folder and saved the Verbena Flowers and Leaves into them, on the Tool Options palette, those two tubes showed up at the beginning or top of the list. PSP first decided Khiba's Tubes came before Tubes, so it showed all the tubes in there first, in order, flowers before Leaves... then it added the Tubes folder and alphabetized all the tubes in there next. Hence Khiba's tubes show up at the top. Had I named my folder Zebra's Tubes, all the verbena tubes in that folder would show up below the tubes for Tubes on the Tool Options palette. Khiba's Pointed Opinions about managing a lot of tubes from various sources. 1. ONLY keep PSP7 original tubes in the PSP7\Tubes folder. That way if PSP7 goes kaput or you need to reinstall it, only the PSP7 tubes are lost. They will reinstall with the program. 2. Make two new folders. One for converted PSP Tubes from prior versions, and Convert all Tubes into that Folder, not the PSP7\tubes folder. One for the tubes you make and make that the Save path folder. Keep all your personal tubes together. 3. In File Locations point PSP7 to all three folders. That's the current limit, 3, so that's why I suggested making the 2 new ones. Set the default folder for saving to your personal tubes folder. You can turn on and off any of the folders if the list is too long in Tools Options Palette by UNchecking Enable path. 4. Back up your two new tubes folders onto CD-ROM's, zip drives, etc. for safe keeping occasionally. Or do this frequently if you add more tubes or make lots of tubes. 5. Occasionally weed out tubes you don't like or which don't work right. Trash them, after you back them up on CD or another place. You can always retrieve and copy to the folders on your hard drive later if you find you need them back! OK, that's that. I am finished lecturing for this week.